Take a look at the image below. 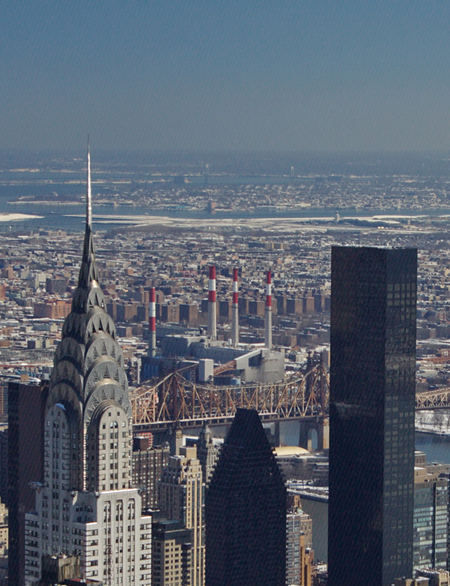 What do you see, apart from the New York Skyline? Can you see stripes? Diagonal stripes? Look in the sky, near the horizon, or at the black buildings in particular. Got it? It took a while and a bit of surfing to find out, but the concensus is that it’s electrical interference from the transmitters on the roofs of the skyscrapers. Makes you think doesn’t it? Just got back from a week in New York City and, after staying awake for 37 hours, have been saved from the effects of jetlag by a terrific headcold. Nice. Luckily, I only started feeling unwell on our very last day in Manhattan, while wandering around 42nd street and 5th avenue, looking to photograph typical street scenes, and avoiding diamond shops. It was cold, damn cold. But after a snowfall on our second day, we actually had very bright, sunny weather, which is good for seeing New York, as most of it is UP. There is no further ‘up’ these days than the Empire State Building, which is an obligatory stop for us tourists. And it’s even colder on the 86th floor, particularly as you walk around to the North side where the sun don’t shine. The building is so high, I was somehow surprised to see birds on the ledges getting in the way of our photographs. 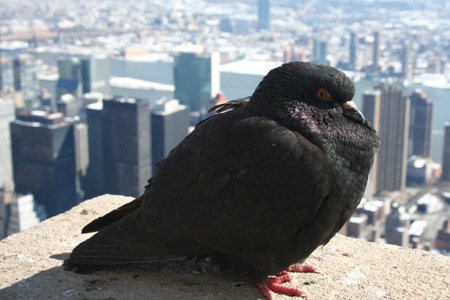 The funny thing was that despite the generally poor attitude we humans have towards pigeons when they’re scavenging on the ‘sidewalk’, nobody was shooing them away at 1000ft above street level – like they might get hurt or something. The building just behind this chap’s head is the UN building.